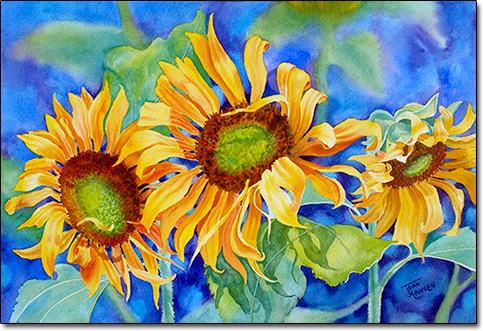 Enjoy the light falling on the sunflower petals, and the shadows clothing the leaves. The colorful soft focused foliage in the background of this watercolor painting allows the eye to focus on the center of interest. This painting is available It is framed with custom moulding and a double matt. When you make your selection, click on the Add to Cart button to finish your purchase. Free shipping for this original painting!